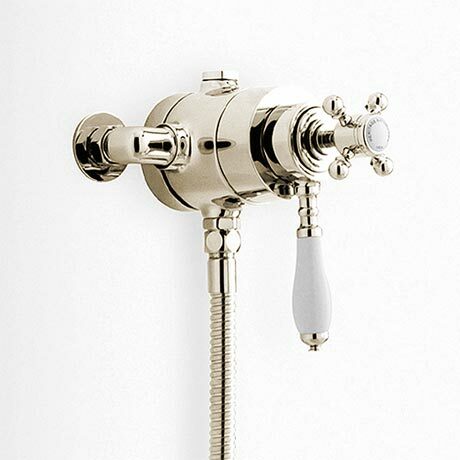 The luxury traditional dual control exposed thermostatic shower valve with bottom outlet, manufactured from brass with a vintage gold finish, Heritage's elegant range of shower valves are precision engineered to provide a luxury showering experience. The shower valve is thermostatic so the water stays a consistent temperature even if the water pressure fluctuates. Quality assured by a 5 year guarantee. Dual controlled thermostatic shower valve allows separate adjustment of flow & temperature controls. Thermostatic shower maintains a constant water temperature to within 1° regardless of the demand on water supply.